India’s share of world research output (3.5% in 2010) has been on an increasing trend since the late 1990s, but this growth is completely overshadowed by that of China. The citation impact of India’s research, though rising, continues to be below the world average. These are the main findings of a recent study undertaken by Thomson Reuters on behalf of the Indian government’s Department of Science & Technology (DST). 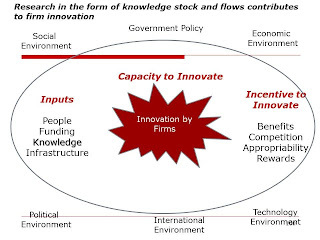 When I first started formal study of India’s innovation system a decade ago, finding relevant data on key innovation indicators was a major challenge. The global comparative studies of innovation such as the Global Innovation Index had not started at that time, databases were not that powerful, and even when databases existed, our access to them was limited. India’s own statistics painstakingly compiled by the Department of Science & Technology were restricted to research and development narrowly defined, and available with a lag of a few years. Given these data limitations, tracking trends in any kind of time frame that would be useful to policy-makers was a difficult, if not impossible, task. Fortunately, that situation has changed. Globally, databases have become more sophisticated, database vendors see India as an important market, and are therefore making a serious effort to compile and present data that is relevant to us (and other developing/emerging market countries). Perhaps most important is the fact that policy-makers today realize the importance of such data in informing policy formulation. 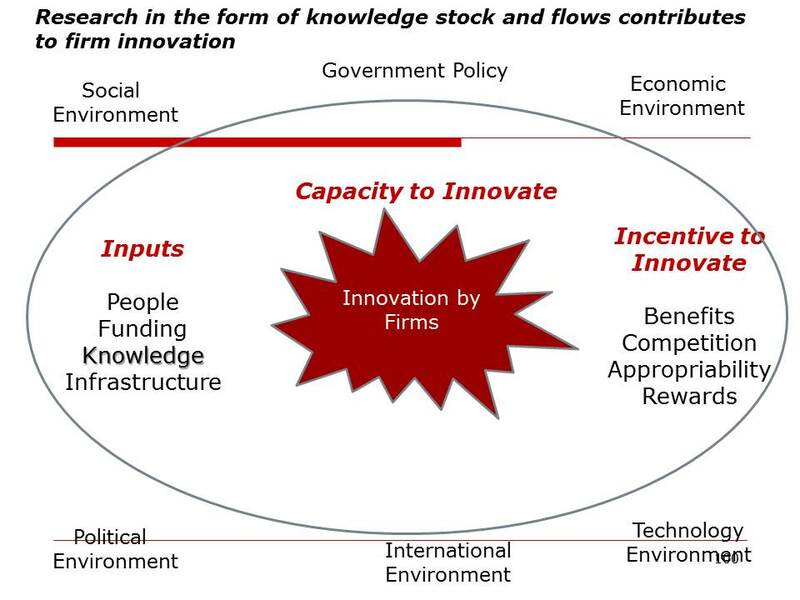 As I discussed in From Jugaad to Systematic Innovation, one of the important innovation indicators for any country is its research output. The simplest measure of a country’s research output is the number of research papers published by people working within its borders. While not all research is necessarily “useful,” a vibrant research community that furthers the stock of knowledge is considered an important pre-requisite of a modern nation. In R&D-intensive fields such as Biotechnology and Nanotechnology, this research activity often feeds into industrial innovation – e.g. today new drug discovery draws directly from the latest advances in different sub-fields of Biology. The ability to publish in journals with a strong review process indicates that scientists have inculcated the scientific method. 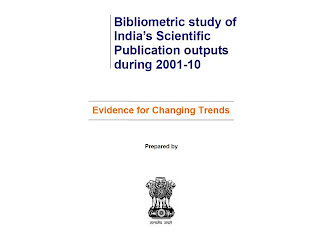 During a recent web search, I was pleasantly surprised to find a fascinating report on India’s research publication output during the period 2000-2010. This report reflects the results of a study undertaken by Thomson Reuters for the DST, and the DST’s conclusions from the study. Thomson Reuters is particularly well placed to make such a study as its Web of Science is one of the best regarded publication databases in the world. Only journals that are published regularly and have a credible review and selection process are a part of the Web of Science. (A competitive offering, Scopus, covers a larger and more geographically dispersed set of journals, but has been in existence for a shorter period of time and hence is not as useful to track long-term trends). India’s scientific output, particularly vis-à-vis China, has been a subject of concern to the Indian science academies, the Scientific Advisory Council to the PM and the Indian government for some time. The first time I was exposed to these concerns was 7 or 8 years ago when I was invited by Dr. Mashelkar to speak on trends in China at a brainstorming session organized by the Indian National Science Academy in Delhi. It’s good to see the government diving into the details, and I hope we’ll see policy actions directed towards these issues. In 2010, India’s share of world research output was 3.5%. India’s share of world’s research output was on a decline from 3.1% in 1981 till the mid-1990s, and regained the 3.1% mark only in 2007. The current trend is therefore an ascending one. [As a benchmark, China’s share of world publications increased from 2.5% in 1996 to 11.7% in 2010, placing it at #2 globally!]. In terms of disciplines, India’s share of world publications was highest in Agricultural Sciences, Plant and Animal Sciences and Chemistry in 1981. In 2010, the three disciplines in which India had the highest shares were Chemistry, Materials Science and Agricultural Sciences. 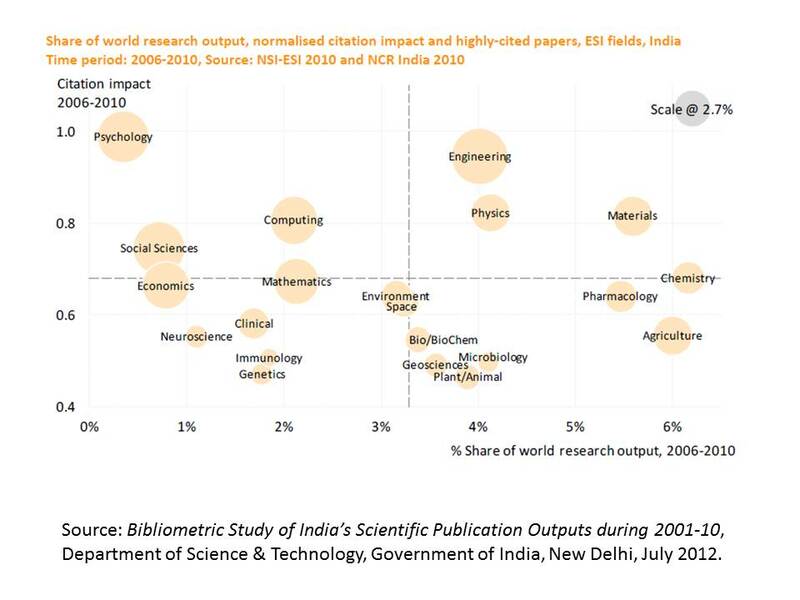 Indian research still has relatively low impact, though this has improved over time. In 1981-85, India’s citation impact was 0.35 (compared to a world average of 1). By 2006-10, this had improved to 0.68. In the period 2006-10, 20% of Indian papers received more than the world average of citations, and 35% received less than the world average. 45% of Indian papers received no citations at all. 2.7% of India’s papers received more than 4 times the world average of citations, and are labeled as highly cited papers. In 2006-10, Engineering had the highest proportion of highly cited papers (6.5%) and shows an upward trend on this dimension, while both Chemistry and Physics showed a downward trend in highly cited papers. India has 2.3% of the world’s researchers and accounts for 1.6% of world spending on R&D. India’s spending on R&D per researcher is about 80% more than that of China, but about half that of the US (in 2007, in PPP dollar terms). 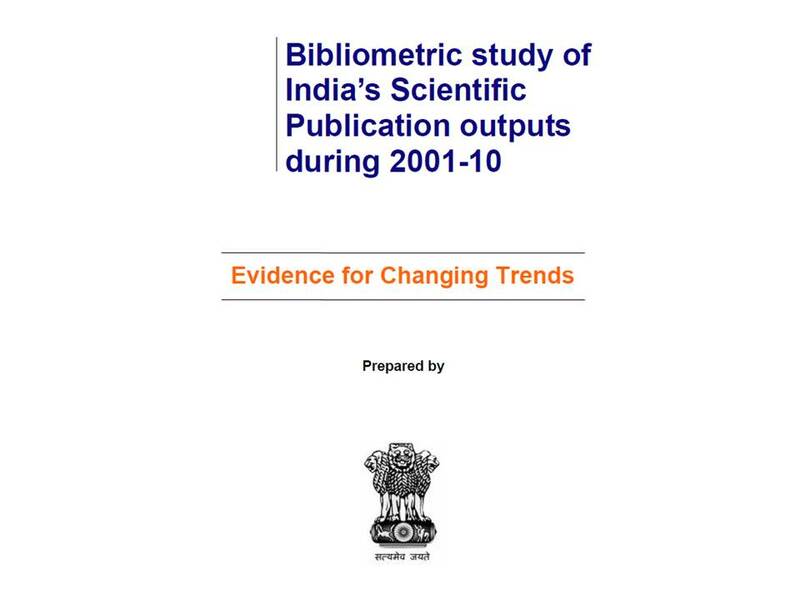 The good news from this report is clearly that the downward trend of research output that began in 1981 was arrested by the mid-1990s, and India’s research output has subsequently been on an upward trajectory. It is important that this trajectory be maintained. The efforts in recent years to improve funding for Science & Technology, enhance the working conditions in academia and research institutions, and evangelise science education appear to have paid off. The government has programmes like INSPIRE that provide encouragement to budding young scientists. Tighter accreditation of the universities under the revised NAC guidelines and the new appraisal processes for faculty introduced by the UGC should also create pressure to enhance research output across disciplines. So, overall, I suspect that volume increases will not be difficult to sustain. However, increasing quality is a much trickier issue. Here a more focused effort may be required. The Thomson Reuters report has classified different fields according to a combination of output and impact. There are three fields – Engineering, Physics and Materials Science – that are the “stars,” i.e. 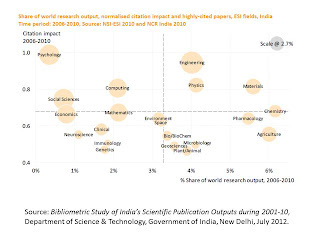 above the Indian average on both share of world research output and citation impact. These may be the best bets for the future. Three other fields – Psychology, Computing and the Social Sciences are above average on citation impact but not on output – these offer the opportunity to scale up without losing quality. Of course, a more careful examination of resources, distinctive research opportunities from India, and the existence of a critical mass of researchers will be required before research priorities can be decided upon. Having higher impact is also related to which journals you publish in. Journals with high impact factors tend to have larger citation impact. Building the right research agendas, being a part of the right networks, skills and aspirations to publish in the top journals are important to be successful in such an endeavor. Some incentivisation to target higher impact journals may also help. At IIMB, our research incentives that are sharply skewed in favour of publishing in higher ranked journals have had some positive impact. In expanding research output, we need to take some precautions as well. One is to make sure that we guard against fraud. Increased pressure for research performance and incentives linked to output will put our academics whose research skills are poor or rusty at a disadvantage. Some of them may be tempted to resort to fraud to meet institutional requirements for promotion. India is already known as a major source of research fraud, and we will need to put in place better verification and validation processes if we need to prevent this from spreading. A second and related measure is to put in place support systems like mentoring and faculty development programmes to help faculty sharpen their research skills.